Each user has a profile with some information such as your points, rank and trophies that is shared with other users. You can also add some of your own data. To do so, go to the user dropdown menu (click on your user name on the black navigation bar at the top) and select profile (figure1). 1. Gravatar: The image on the left is your gravatar. A gravatar is a graphical representation of you that can be used across multiple sites and applications. If you haven't created a gravatar yet, a random image will be generated for you. You can change this by clicking on the 'Edit gravatar' button. This will guide you to the gravatar.com website, where you can create images linked to your email address. If you create one for the email address you used when signing up for Jazyk, you will see it here as well. Your gravatar is also always visible next to your username, e.g. on the navigation bar at the top of your screen. 2. 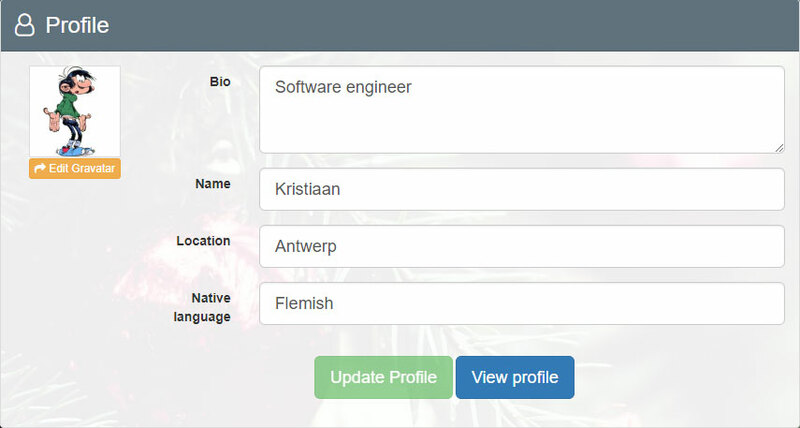 Bio: You can if you want also enter a short biography or any other information you want to share with other users. 3. Name: Here you can enter your real name if you wish to do so. 4. Location: Optionally you can enter the place where you reside here. 5. Native language: FInally you can also share your native language with other user. Note that none of these fields on your profile are mandatory. You can leave some or even all fields blank. 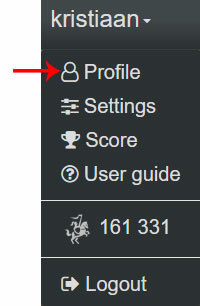 Once you've made changes to your profile, the green 'Update Profile' button becomes active. Press this button to submit the changes. The blue button labeled 'View profile' shows your public profile.